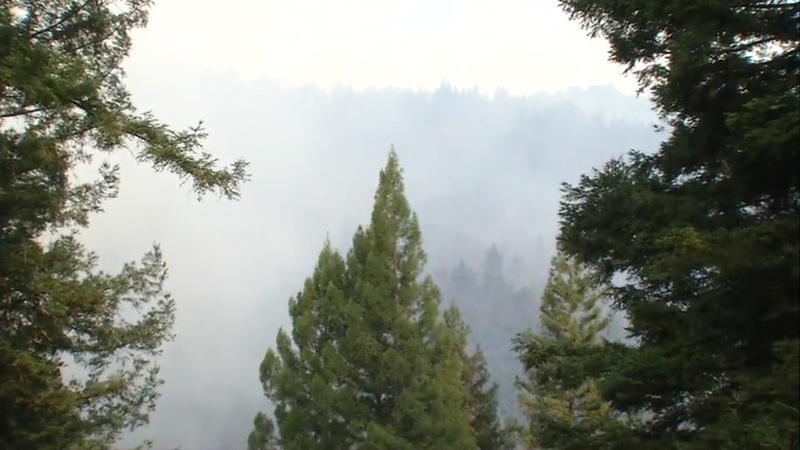 SANTA CRUZ, Calif. -- The Bear Fire in unincorporated Santa Cruz County is "calming down" and is now 50 percent contained, a Cal Fire division chief said Saturday morning. "We're somewhat scaling down now that the fire is calming down," said Cal Fire Division Chief Angela Bernheisel. "We want to put this thing to bed." Fire crews are continuing to establish and reinforce containment lines around the fire. There are now 34 engines, three water tenders, one helicopter, 13 hand crews, two dozers and 75 other resources fighting the blaze, down from earlier in the week. The fire has burned 391 acres, according to Cal Fire. Bernheisel said Santa Ana winds are expected in Southern California, "so we need to be able to put this thing totally to bed so we can be available for the next potential start that might happen." Saturday's temperatures are expected to range between 59-67 degrees, with a minimum humidity of 55-65 percent. North winds of 5 mph shifting to the west are expected in the fire area. Evacuation orders are still in effect for Bear Creek Canyon Road, Deer Creek Road, Rons Road, Dons Road, and their tributary streets in the fire area. Bear Creek Road between Hawk Ridge Road and Highway 35 is open to residents only, Cal Fire said. The fire started Monday night at 10:37 p.m. and has destroyed four structures.